Hand built in Santa Rosa, California from $1775. Fitz Cyclez, affordable custom TIG welded and lugged steel frames and forks. Whether you are a randonneur, globe trotting adventurer or sidehacker, a Fitz bike will get you there in old world elegance with a modern flare. 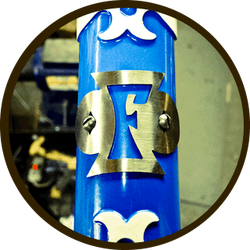 My frame building lineage dates back to 2003 working at Rock Lobster Cycles with Paul Sadoff, 7 years building independently in Hilo, Hawaii and then two years working with Ahren Rogers of Banjo Cycles. I wanted a bike that fit perfectly, and was purpose-built for the types of rides I do. What I got was a bike that is unique, beautiful, and a remarkable ride. It's quick, solid, and handles better than any bike I've ever owned. John was amazing to work with. He's patient, insightful, and an emerging master of his craft.